"Puglia" redirects here. For other uses, see Puglia (disambiguation). Apulia (/əˈpuːliə/ ə-POO-lee-ə; Italian: Puglia [ˈpuʎʎa]; Neapolitan: Pùglia [ˈpuʝːə]; Albanian: Pulia; Ancient Greek: Ἀπουλία) is a region of Italy in Southern Italy bordering the Adriatic Sea in the east, the Ionian Sea to the southeast, and the Strait of Òtranto and Gulf of Taranto in the south. Its southernmost portion, known as Salento peninsula, forms a "stiletto" on the "boot" of Italy. The region comprises 19,345 square kilometers (7,469 sq mi), and its population is about 4 million. 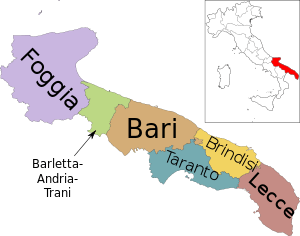 It is bordered by the other Italian regions of Molise to the north, Campania to the west, and Basilicata to the southwest. Across the Adriatic and Ionian Seas, it faces Albania, Bosnia-Herzegovina, Croatia, Greece, and Montenegro, The Apulia region extends as far north as Monte Gargano. Its capital city is Bari. Puglia's coastline is longer than any other mainland Italian region. In the north, the Gargano promontory extends out into the Adriatic, while in the south, the flat and dry Salento peninsula forms the 'heel' of Italy's boot. It is home to the Alta Murgia and Gargano National Parks. 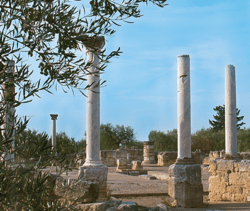 Apulia is one of the richest archaeological regions in Italy. It was first colonized by Mycenaean Greeks. A number of castles were built in the area by Holy Roman Emperor Frederick II, including Castel del Monte, sometimes called the "Crown of Apulia". 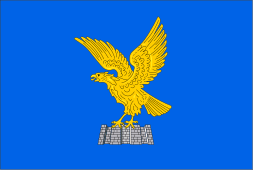 After 1282, when the island of Sicily was lost, Apulia was part of the Kingdom of Naples (confusingly known also as the Kingdom of Sicily), and remained so until the unification of Italy in the 1860s. This kingdom was independent under the House of Anjou from 1282 to 1442, then was part of Aragon until 1458, after which it was again independent under a cadet branch of the House of Trastámara until 1501. 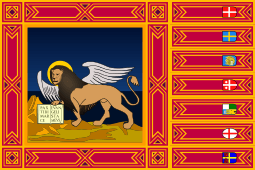 As a result of the French–Spanish war of 1501–1504, Naples again came under the rule of Aragon and the Spanish Empire from 1504 to 1714. When Barbary pirates of North Africa sacked Vieste in 1554, they took an estimated 7,000 slaves, and the coast of Apulia was occupied at times by the Turks and at other times by the Venetians. In 1861 the region became part of the Kingdom of Italy, with the new capital city at Turin. In the words of one historian, Turin was "so far away that Otranto is today closer to seventeen foreign capitals than it is to Turin". The region's contribution to Italy's gross value added was around 4.6% in 2000, while its population was 7% of the total. The per capita GDP is low compared to the national average and represents about 68.1% of the EU average. In comparison with the country as a whole, the economy of Apulia is characterised by a greater emphasis on agriculture and services and a smaller part played by industry. The share of gross value added generated by the agricultural and services sectors in the total gross value added of the region is above the national average in 2000, whereas the share of industry is below. In the last 20 years the industrial base of the region's economy has changed radically. Alongside highly capital-intensive large-scale plants – such as ILVA (steel-making) in Taranto and Eni (petrochemicals) in Brindisi and Manfredonia – a network of small and medium-sized firms has gradually expanded, and these now provide approximately 70% of the jobs in the region. The majority of such firms are financed by local capital. 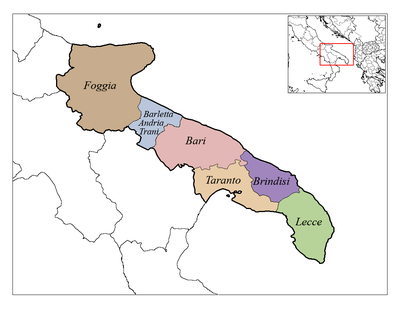 As a result, highly specialised areas have developed, producing on a scale not only of domestic but also of international significance: food processing and vehicles in the province of Foggia; footwear, textiles, wood and furniture in the Barletta area north of Bari; wood and furniture in the Murge area to the west; engineering, rubber, wood and furniture and computer software around Bari itself; textiles and clothing at Monopoli-Putignano to the south; and footwear and textiles in the Casarano area. In certain of these sectors – especially textiles, clothing, footwear, vehicles and food products – the region has attained a significant degree of competitiveness with foreign producers. 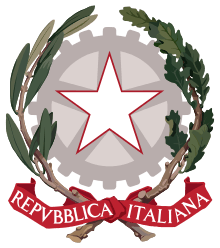 A major contribution to the competitiveness of the region's economy stems from the existence of important research and development centres such as Tecnopolis-CSATA near Bari, the Cittadella della ricerca (Centre for research and new materials) near Brindisi and the new software development centres, again near Bari. The region has a good network of roads but the railway network is somewhat inadequate, particularly in the south. Apulia's 800 kilometers (497 mi) of coastline is studded with ports, which make this region an important terminal for transport and tourism to Greece and the eastern Mediterranean. Between 2007 and 2013 the economy of Apulia expanded more than that of the rest of southern Italy. Such growth, over several decades, is a severe challenge to the hydrogeological system. Emigration from the region's depressed areas to northern Italy and the rest of Europe was very intense in the years between 1956 and 1971. Subsequently the trend declined as economic conditions improved, to the point where there was net immigration in the years between 1982 and 1985. Since 1986 the stagnation in employment has led to a new inversion of the trend, caused by a decrease in immigration. Since 1 June 2015, former judge and mayor of Bari Michele Emiliano of the Democratic Party has served as President. Cuisine plays an important role throughout Apulia. The key locally produced ingredients used there include olive oil, artichokes, tomatoes, eggplants, asparagus, and mushrooms. As with the other regions of Italy, the national language (since 1861) is Italian. However, as a consequence of its long and varied history, other historical languages have been spoken in this region for centuries. In isolated pockets of the Southern part of Salento, a dialect of modern Greek called Griko is spoken by a few thousand people. A rare dialect of the Franco-Provençal language called Faetar is spoken in two isolated towns, Faeto and Celle Di San Vito, in the Province of Foggia. The Arbëreshë dialect of the Albanian language has been spoken by a small community since refugees settled there in the 15th century. ↑ "Regional gross domestic product by NUTS 2 regions - million". Eurostat. Retrieved 8 September 2013. ↑ "Introducing Puglia". Lonely Planet. Retrieved 14 November 2016. ↑ "Holiday guide to Puglia, southern Italy: the best towns, restaurants and hotels". The Guardian. Guardian Media Group. 4 July 2015. Retrieved 15 November 2016. ↑ "Italy: Puglia". Rough Guides. Retrieved 8 December 2013. ↑ "Eurostat". Greenreport. Archived from the original on April 24, 2014. Retrieved 2010-08-02. 1 2 3 "Eurostat". c.europa.eu. Archived from the original on August 21, 2009. Retrieved 2010-04-22. ↑ Amílcar Soares, Maria João Pereira, Roussos Dimitrakopoulos! geoENV VI – Geostatistics for Environmental Application (2008), p. 191: "The approach highlighted the widespread degradation of water resources in the Apulian groundwater. ... Above all the rapid socio-economic growth over the last decades has caused severe stress to the Apulian hydrogeological system." ↑ "Eurostat". c.europa.eu. Archived from the original on July 21, 2011. Retrieved 2010-04-22. ↑ "Scheda Personale". Sito web Istituzionale della Regione Puglia (in Italian). Retrieved October 17, 2015. ↑ "BIOGRAFIA" (PDF). CompletaMente.org (in Italian). Retrieved September 5, 2015. ↑ "Ethnologue report for language code:ell". Ethnologue.com. Archived from the original on 28 May 2010. Retrieved 2010-04-22. ↑ "Ethnologue report for language code:aae". Ethnologue.com. Retrieved 13 July 2016. Wikimedia Commons has media related to Apulia. Wikivoyage has a travel guide for Apulia.